Many, many years ago when I was a lot younger, I had the pleasure of working for a well-known restaurant, Cracker Barrel Old Country Store. Other than my Mom teaching me to cook, I learned a few recipes working at Cracker Barrel. This wonderful breakfast food is simple elegance at its best: grilled sourdough bread with an egg cooked gently inside this toasted delight. Cracker Barrel will serve this recipe up with their famous fried apples, or even their hash brown casserole, you get to choose. It’s simply delicious! Heat a non-stick skillet over medium heat. Use one small biscuit cutter or a small juice jar to press into the sourdough bread. Twist slightly so the bread “cuts” and you can remove the cut out circle. Spread the margarine or butter on both sides of the bread and place the bread into the pan. 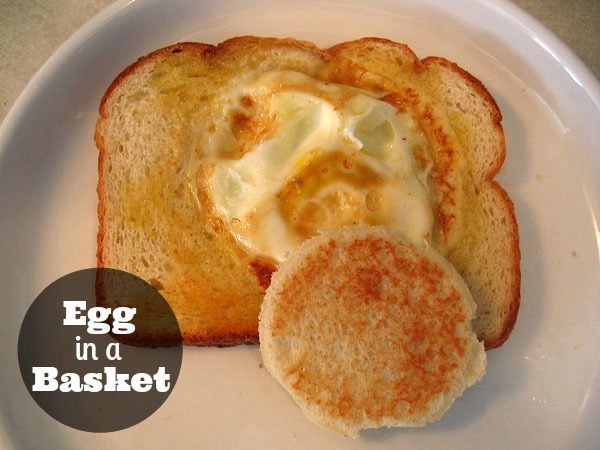 Place the cracked egg into the hole. When the bread is toasted on the bottom side (it takes about a minute), flip the bread over and allow to toast on the other side. Season with salt and pepper to taste.